GravityZone Advanced Business Security is the all in one security solution for mobile devices, workstations, and servers due to it combining all the security services a business needs into a single security platform. It provides the best overall balance of protection from threats and performance out of the BitDefender GravityZone software solutions. Aventis Systems will be carrying Subscription Licensing for BitDefender GravityZone Advanced Business Security software. License term limits range between 1-3 Years and cover one device per license. 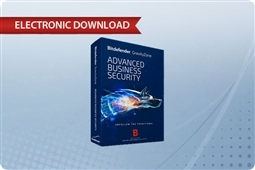 Choose from our selection of BitDefender GravityZone Advanced Business Security licensing below and find the perfect all in one security solution to keep your business protected from threats today!